Long time readers will know I'm a huge fan of Swagbucks. It's an easy way to cover my entertainment budget, save big on holiday shopping sprees and make money trying out new products i would otherwise be skeptical of. The downside of Swagbucks is that the site gives you so many different ways to earn that it can be complicated and hard to keep track of all it's earning features. 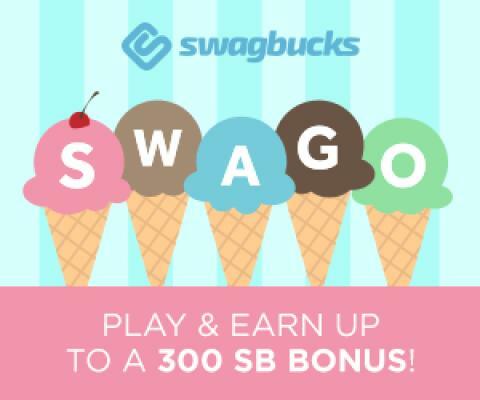 Well, Swagbucks runs this promotion once a month called SWAGO. It's like BINGO, except each square takes you to a different part of their site where you can earn points, called SB, doing something easy online. You get paid for filling out your board - the more spaces you fill out, the bigger your bonus! This month, the bonus for filling out your whole board is 300 SB, which you can redeem for a $3 gift card right away. But, that's just the start of your earnings with SWAGO. Because the game takes you to every nook and cranny of their site, you end up earning a ton of points along the way and learning if Swagbucks is right for you. How much? Well it varies a bit, but I just completed every square this afternoon and ended up with 3,492 SB, just 9 SB shy of $35 worth of PayPal Cash or any Gift Card I could imagine. The full breakdown is below but the shorter version is I made $35 online this afternoon clicking around the web in my pajamas. Tonight I am going to watch a few more funny animal videos to get me over the line so I can redeem another $15 in Gift Cards to add to my splurge fund! What are you waiting for? Join Swagbucks today and start earning your own free gift cards!